Aqua Clara International (ACI) has been working in the Kisii region of Kenya since June 2009 and has recently launched a sister program in the rural areas around Eldoret. The Kisii region is a hilly and densely populated area with fairly regular and consistent rainfall. The rural areas around Eldoret are more sparsely populated and the dry seasons tend to be longer. We are working with schools in both regions that are good candidates for rainwater harvesting (RWH) projects and expanded hygiene education. There is significant local interest in our low cost, high quality, locally made RWH systems. There is a great need to educate school children on better WASH practice. The most common water sources in the Kisii area are springs (both protected and unprotected) as well as surface water. From our survey information, we have found that the average length of time that it takes people to walk to and from their water source is around 45+ minutes. When families or schools are large, multiple trips are necessary to provide sufficient water for their needs. Women and young girls are the people who bear most of the burden for collecting water which means lost time at school and for other important activities. The most common water sources in the Eldoret region are shallow wells and surface water. Our test results on a wide range of water sources in both areas have shown high levels of bacteriological contamination. In both regions, we have observed that some of the schools and households have rudimentary rainwater harvesting systems which help to lessen the burden of the daily search for water. The rainwater tanks that we have come across are typically in poor condition with open or rusting collection containers, leaky gutters and no way to flush or clean the container. The costs to get good rainwater harvesting units to the rural areas are often prohibitively expensive for rural people. There are several layers of 'middle men' throughout the supply chain that increase the costs substantially. Our tests on the rainwater, although better than the ground and surface water tests still show significant bacteriological contamination. Water borne diseases such as amoeba, typhoid, diarrhea etc are still very common in both areas. It is obvious that water filtration is not enough. Hygiene education is also a very pressing need in the area, especially for school children and women. Last year, thanks to funding from Blue Planet Network, ACI was able to establish a WASH Training Center in the Kisii region as well as train and launch a number of new filter producing businesses. Currently, ACI has 35 Community Development Entrepreneurs (CDEs) in the Kenya who are actively constructing, marketing, selling and maintaining ACI biosand water filters and safe water storage containers. These small businesses are based at rural schools which also serve as demonstration sites for ACI WASH products. ACI also has a network of Community Health Promoters (CHPs) who actively oversee the work of the CDEs as well as providing additional hygiene education to the filter end users and children at the ACI schools. ACI has been able to set up a number of demonstration RWH units at the WASH Training Center and there has been significant local interest in this expansion of the project. This number is based upon the production and sale of one rainwater harvesting system per Community Development Entrepreneur every 3 months for the first 3 years of production. The average family size in the communities that we work in is just under 6 people per household. 360 units multiplied by 6 people per household equals 2,160 people getting water. This project is based at schools. The final selection of schools will be made when the project implementation phase begins so this number is based on a conservative estimate of 250 students per school. Not applicable in this proposal. 20 Aqua Clara Community Development Officers will gain a new skill in rooftop rainwater harvesting system construction. The ACI model is based on the premise that the projects should be locally managed and as locally driven as possible. We train local experts to build WASH products out of locally sourced materials and help to create locally sustainable small businesses. ACI believes that there should be a local expert available to perform any necessary maintenance and also serve as an easily accessible information resource for the local community. The Community Development Entrepreneurs (CDEs) are based at rural primary schools - the schools serve as demonstration sites for the ACI technology as well as providing secure storage for the raw materials. The school children and teachers benefit by using the WASH products, while also learning about good WASH practice. Local community members are able to visit the school, see the products that are available at first hand, potentially buy the product and also learn about good WASH practice. ACI works by training the CDEs and supplying them with sufficient tools and materials for their first set of products. The CDEs then sell these products to their local community at a small profit that is set by ACI. The material cost of the product is repaid into what we call our material resupply bank account - that money then covers the next set of raw materials for the next set of products. This approach is also known as micro-consignment or a revolving loan. ACI recognizes that in order to optimize the effectiveness and impact of our water program, we need to add other WASH related training and technology. The next steps include adding rainwater harvesting to the product mix and to extend the hygiene education that is available to the school children at ACI partner schools through school Water & Hygiene Clubs. ACI has set up various sizes of rooftop rainwater harvesting systems at the WASH Training Center. We recently had a visit from a CAWST International Technical Adviser who helped us work through some of the design issues as well as add a simple system to minimize debris getting into the rainwater tank. As with our biosand water filters, we have used locally available plastic containers for the demonstration RWH units. Plastic has the advantages of being easier to work with, cheaper to transport to the end location and of course cheaper to the end user. Through our work with biosand filters, ACI staff have established relationships with plastics manufacturers and have been able to secure much lower delivered prices on the main components for the rooftop RWH systems. As with the biosand filters, ACI staff will manage the RWH supply chain to ensure that quality remains high and that cost remains low. ACI plans to use the same system of oversight that has been established for the biosand filters to monitor the construction standards and use practices of the RWH units. There is a sound economy of scale in adding additional products to the same oversight and management loop. The school RWH will be similar to the ones that have been set up at the training center. There will be one large 10,000 liter tank that will directly help to serve the water needs of the school population. ACI will also demonstrate a series of smaller RWH units of 2,000, 1,000 and 500 liter capacity so that community members can see and purchase a more affordable unit for their household use. The school and community contribution to the RWH system at the school will be in the form of labor, timber to support the gutters and the construction of the base of the system. ACI will be following the approach of another organization called Waterlines who have substantial experience of implementing RWH systems at schools in a neighboring region. The community contribution to the units will be around 20%. The CDEs and schools will be selected for the RWH project based on a number of criteria including but not limited to: success and proven high standards of filter construction; availability of water; frequency and volume of rainfall (measured by ACI rain guages at each school); and need for water. ACI has recently begun several school based Water & Hygiene Clubs. There are several reasons for this. It is widely known that children are early adopters of new ideas and products and they are in a unique position to help educate their family members at the household level. We have targeted the clubs to be open to children from classes 5-8. Our Community Health Promoters believe that this is a key age as these children are beginning to take more responsibility for the household hygiene and water needs. The schools are the local face of the ACI program and with that in mind, it is important that the various products are properly demonstrated and used. Some of the practical responsibilities of the clubs are to ensure that the biosand filter is used regularly, to clean the safe water storage containers on a daily basis according to ACI training, and to ensure that the hand washing stations have sufficient supply of water and soap. ACI supports the school Water & Hygiene Clubs through the ACI Community Health Promoters (CHPs). Part of the CHP monthly meeting focuses on the lesson plans for the upcoming month of school club meetings. The Water & Hygiene clubs meet weekly and the CHPs attend the meetings twice per month on alternating weeks to carry out a lesson plan that has been set by ACI. These lessons will cover a variety of topics including water treatment options, disease transmission, hand washing etc and are designed to be practical, informative and fun. On the interim weeks when the CHP is not at the club meetings, it is the club's responsibility to teach what they have learned to another class at the school. This will help reinforce what they have learned while also helping to educate other students at the school. The relationship between ACI and the rural school is a partnership. For example, ACI will provide one safe water storage container and one handwashing station per classroom, but only after the school and parents have constructed wooden stands for the products. The school when it signs up to partner with ACI must also sign an agreement to ensure that all the products are used properly and according to high standards. The ACI model is based on community ownership and local demand for the project. The selection process for the CDE and CHP involves a community nomination process which helps with local accountability. Transfer of ownership of the products is based upon consistent proper use by the schools. The ACI CHPs inspect the various products when they visit the school Water & Hygiene clubs and e.g. ensure that the hand washing stations have soap etc. The project and products are very accessible to the rural community members surrounding the schools as they are seen as neutral ground. The most important aspect of ownership is that the CDE essentially runs their own small social business - their success is based upon their own motivation and local demand. ACI has found that community members are proud that their biosand filter or safe water storage container is made by a local person. ACI actively works with the local District Education Officer in both regions of operation. The District Education Officer is instrumental in introducing the project to the local schools and the improved WASH standards in the schools are in line with the Kenyan governmental guidelines. Our WASH Training Center is based at the District Officer's compound in the Kisii region - the space for the center was donated by the District Officer on behalf of the local community. ACI also has a close working relationship with the District Agricultural Officer in the Kisii who regularly uses the training center and particularly the demonstration Eco San latrines and high yield gardens when she trains local farmers. The ACI program builds local capacity. CDEs gain job skills in construction, marketing, and business management. CHPs learn how to train key audiences in better WASH practice as well as how to carry out surveys and basic water tests. There is a huge and currently unmet need for better constructed, lower priced products that help improve the WASH standards in rural communities. ACI is working to help meet this need in a locally driven and sustainable way. The RWH units will need occasional flushing but there will be no ongoing maintenance costs. There is no ongoing cost to ACI once the system has been installed, and any oversight costs will be covered by carbon credit financing from the biosand filter project. This number includes 6,916.63 - 20% of the cost (approx.) of each RWH system at each school will be provided by the community, through labor and local materials (timber for facia, sand and ballast for base if available, etc.). The remaining $32,530 is a figure computed from the estimated 360 RWH units that will be sold to households over three years (at an estimated 1 for every 2 months per CDE). An average sales price of $90.36 was computed based on 1,000 liter tank purchases with short gutter runs. Of course, this number will vary substantially depending on the number and type of units actually sold. Hi colleagues. Is there any provision of a filtering tank or other filtering method that will not only minimize the amount of debris but dirty water particularly that of the first rains that washes all the dust and other particles on the rooftop so that only clean water enters the tank for usage? Thanks. Is there any provision of a filtering tank or other filtering method that will not only minimize the amount of debris but dirty water particularly that of the first rains that washes all the dust and other particles on the rooftop so that only clean water enters the tank for usage? Thank you for your question. In planning our systems for our schools we have consulted with CAWST technical advisers and have settled on a simple t-junction which will allow for the first flow of water of the roof from each rain to flow into a catchment tube, the length of which will be calculated based upon the size of roof and length of gutter. This system will be a simple way of ensuring that all debris will flow into this catchment tube at the beginning of each rain, allowing the remaining rain to flow directly into the catchment tank. After each rain, this tube can simply be uncapped which will flush it out preparing it for the next rain. Are water samples taken for testing to insure water collected is safe for drinking? Thanks for your question. We do not intend that the rainwater water be used for drinking. The schools that will receive the rain water harvesting systems will already have a number of Aqua Clara bio-sand water filters installed and in use. 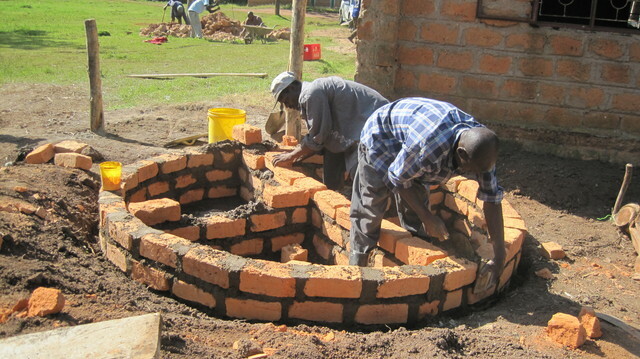 The rainwater is designed to be a more easily accessible input source of water for the bio-sand filters as well as being a good demonstration of rainwater catchment systems for the surrounding community. We will certainly be testing the water from the rain water harvesting systems as part of our regular monitoring of our program. What is the lifetime of the plastic tanks in the sun? Are the tanks made from special plastic that is safe for the water? Thanks for your question. All of the tanks that we will be using are made from non-toxic, non-absorbent, UV stabilized food grade polyethylene. The rainwater tanks at the schools will be protected from the sun by a simple shelter that will be constructed from materials provided by the parents and the school. The roof space from the 10,000 liter rainwater shelter will also be used for additional rainwater catchment. The lifespan of the system if properly cared for is expected to be 25+ years. Looks like an awesome project!! I appreciate the "community ownership" aspect to your program. 1. Echoing the above concern, what type of plastic will be sitting out in the sun? Will it eventually contaminate the water? 2. How often will the school sites be visited by Aqua Clara for updates and monitoring? Thanks for your feedback and questions. I really enjoy this process and learning about other projects. 1. See my response to the question above. 2. The school sites will be visited by ACI Community Health Promoters (CHPs) twice per month when they are also training the students at the school Water & Hygiene Clubs. This will help ensure that the products are well cared for as well as providing another WASH product that the students to use and learn about. The Aqua Clara program established in Kenya is very impressive. Structuring the Community Development Entrepreneurs, Community Health Promoters, Water Hygiene Clubs, micro-consignment and winning discounted pricing on WASH products are all amazing accomplishments, especially if this has been done just since 2009. I suspect that ACI must have the benefit of exceptionally motovated and organized personnel, but the timeline is still impressive. Were ACI to publish a guide for other NGO's to follow, I'd certainly stand in line to buy one. What staff size is required to develop and maintain the initiative and keep this intrastructure moving ahead? In establishing a partnership with a school, is this done locally, or is the School District involved in the process? Thank you for the informative proposal and good luck with your projects. We appreciate your kind comments and support. We are excited about the ACI program model and it is even better to see it working in practice. We have a small staff - 2 full time US staff and in Kenya we have a team of 4 Kenyan staff supported by a combination of long term and short term US intern support. Our goal is to keep the staff numbers minimal so that the program can operate efficiently. The Community Development Officers all run their own small independent enterprise, so they are not paid by ACI, nor do they count as staff. The Community Health Promoters are paid a small amount for each filter visit that they perform, but the number of visits varies according to the productivity of the CDE that they oversee, so our oversight costs are tied to productivity. Although we aim to keep our staff size nimble, we do foresee adding additional Kenyan staff members as the program grows and develops to its full potential. When establishing a partnership with a school, we first meet with the District Education Officer who calls a meeting for all the primary school headteachers in his/her educational zone. ACI staff then do a presentation on the ACI program model after which interested schools submit an application form to ACI. The District Educational Officer is invited to all the ACI events, and is occasionally consulted, but does not have any direct say over how the program operates in the area. 1. Your last project had CDEs work on BSF and this project has a new set of CDEs working on RWH. Your were hoping to hit a 70% success/retention rate, if I'm not mistaken, with the CDEs and BSF manufacture. Were you able to get there in the 1st year? Despite the differences, were there any lessons learned from the last project, that can be applied to ensure retention/success of CDEs? 2. Are 4 systems/year a reasonable target? Out of curiosity, how many households and what is the typical area (sq km) of a CDE's territory? 3.What is the typical duration of the construction and installation of a RWH? Thanks for your questions and comments - I'm glad to clarify. Also, thanks for referring back to our previous PWX project that is currently in full swing. 1. We are not adding new CDEs to the program in Kenya - we are adding a new product to the existing network of CDEs. Our goal is to continue to add new and beneficial WASH products to what the CDEs can construct and sell to their local community at a lower cost while maintaining high quality. Of our current network of 35 CDEs, we will select 20 to go forward for training on the rainwater harvesting program. We will be selecting these 20 CDEs based upon their proven commitment to quality and sales as well as the needs of the schools from which they operate their small businesses. We are continually learning lessons about how to encourage retention and success of the CDEs. For example, with the biosand filter program, we have added a system of rewards and penalties. Our local Kenyan staff developed a system of yellow and red cards for CDEs who fail to sell the minimum of 3 filters per month or if they are found to be cutting corners in filter construction standards. Conversely, we also have a 'CDE of the month' which rewards the most productive CDEs with a bonus and recognition for their hard work. While the school communities still nominate the CDEs and CHPs, ACI staff now interview the candidates and this has helped select better candidates for the positions. It is difficult for a community to understand exactly what the roles entail when the program is new to them, so the interview process helps select better candidates. 2. I think that 4 systems/year is a reasonable target, but of course we also expect to learn more about this when the project is implemented. From our focus groups and end user interviews, there is significant interest in the 'level 2' products - level 2 being the rainwater harvesting systems and the affordable latrines. There is quite a lot of variance in the territory of the CDEs. We aim to select one school per sub-location which is one of the geographical boundary descriptions in Kenya. The levels are as follows: village; sublocation; location; district; constituency. A sub-location could encompass a number of villages and its size will also depend on the population. In the Kisii area, the sub-locations are more tightly grouped as the population is more dense whereas in the Eldoret region, the sub-locations are more widely spread as the population is more sparse and people own comparatively larger plots of land. 3. The typical duration of the construction and installation of a RWH system is around one week. This will not be one week of constant work, but will include time for the concrete base to cure, as well as time to install the gutter system on the roofs. As I have mentioned before, the purchasing household will also have to play an important role in supporting the more skilled work of the CDE in constructing and installing the system. Good work in supporting marginalized people. Please can you briefly tell us the challenges you have been facing in running this type of project especialy during drought and how you have been managing it. Thank you for your comments. Great question by the way! One of the main challenges in running our project is to ensure that we maintain good relationships and provide good support across our dispersed network of rural entrepreneurs. Transport times for our office staff to travel to visit each of the rural schools can be up to 3 hours. We have also faced the challenge of maintaining high quality standards of construction across the network - our commitment to having the Community Health Promoters visit every product that is place within the first 60 days has helped to maintain these high standards. In terms of how we will manage the program during drought, the majority of the rainwater systems are being placed in areas that do not have very long periods between rains. Some of the units will be placed at schools that have longer dry periods, but in these cases, as the rainwater runs out, the schools will revert to their previous source of water until the rains come again. The schools are also welcome to purchase other rainwater harvesting systems from the CDE that is based at their school if they wish to increase their storage capacity. The bottom line is that all of the products demonstrated at the schools will help the students have a better WASH situation at school, as well as serve as items for local community members. This is a projects for schools so your number of people getting safe drinking water should be zero (that number is for people getting full-time access to water). The number you have put in the school children getting water is the right one (those who get water during the school day). Some more details on the costs of the training would be good. 16,000 KSh = $193. You have added 15% for overhead, is that for your Kenyan office/staff or also the US office? Some more details on the costs of the training would be good. 16,000 KSh = $193. You have added 15% for overhead, is that for your Kenyan office/staff or also the US office? Thanks for the questions Rajesh. The costs of the training include the following: residential training for the ACI school rep and the Community Development Entrepreneur (essentially 2 people per school multiplied by 20 schools which equals 40 people); transport for the participants to and from the training session; food costs for training; training materials; basic tools necessary for the new RWH product for each of the 20 Community Development Entrepreneurs (CDE); receipt and tracking books for each CDE as well as some general marketing items. There is also some money built into this cost for ACI local staff visits to help with the initial construction of the first few units as well as product tracking. The 15% overhead will go towards our Kenyan office staff costs - transport to visit the schools; internet; stipends etc. I'm curious about the costs of the tanks. I understand in Kenya - in my experience, that the costs of plastic seems to be less only when you get to a certain size. then it becomes cost intensive. do you have a price comparison for the 10,000liter plastic tank vs an ISSB or ferro cement tank? What kind of community engagement is there in the construction of the system? Thanks for your question - I'm glad to provide clarification and depth to the proposal. While your comment about the costs of plastic tanks is true when it comes to general retail cost in Kenya, we are talking about the wholesale costs in this proposal. We are able to source the tanks at the wholesale costs directly from the manufacturer based upon the relationship that we have built up from the purchase of the plastic 75 liter tanks that we use for our bio-sand filter project. This means that the costs of the tanks can be up to 40% less than the same tank that would be available from the local market place. While we admit to not having calculated the costs of an ISSB or ferro cement tank, the main goal of our project is to add WASH related products to the menu of products available from our dispersed network of Community Development Entrepreneurs (CDEs) while also improving the overall WASH situation for the students at the host school. The reality is that it is easier to train the CDEs in plastic rainwater system installation as opposed to the other options and there is greater ease of distribution across our dispersed rural network. The costs to the end user are also going to be significantly lower which helps them to be able to purchase a high quality, well constructed rainwater catchment system from a local producer without subsidy. One of the main aims of this project is to create a demonstration site that local people can come and see high quality, well constructed WASH products that can then be bought at an affordable cost directly from the local CDE. This is what helps to provide a wider and more lasting impact in the local community as well as assisting the students and teachers at the school. The level of community engagement is one of the main strengths of the ACI program model. I will divide my response to this question into 2 parts - households and schools - as there is a slightly different answer for each. As the schools are providing the space and storage for the Community Development Entrepreneur's business, ACI gradually donates a range of hardware that will help improve the overall WASH situation of the school. However everything is a partnership. The school and parents must provide the unskilled labor, some of the materials for the base for the rainwater tank (sand, brick, ballast etc) and the fascia board (timber) to mount the gutters. They will also be providing the timber for the shelters for the rainwater tanks. The school Water & Hygiene Clubs will also be involved in tracking the amount of rainfall and the amount of water used as part of their partnership with ACI. The households who purchase a rainwater catchment system from their local CDE will have to organize the delivery of the tank, gutters etc from the school to their household. They will also be providing the unskilled labor for the construction of the system. As with the ACI bio-sand filter project, this will be clearly stipulated in the purchase agreement so that each party is clear about their responsibilities. Great! thanks Claire. It's great that you can get wholesale prices for the tanks. Do you have to buy them all in bulk and have a storage space, or do you distribute them immediately? Would you consider yourself a distributor? Does Aqua clara make a profit from the distribution/sales of the filters? Aqua Clara does not make a profit on the distribution/sales of the water filters - we break even and we are a non-profit organization. We don't buy the tanks for the RWH units in bulk and store them, but what we will do is wait until there is a certain number of orders for the tanks before arranging for an order and delivery to make the transportation costs most efficient. Is there any rainfall data to show how much water can be collected? Some calculations regarding roof area and storage tank size? How much of the year can they rely on this source of water? What happens the rest of the year? Can they use the tank for storage? You have put 13,500 liters as the capacity for RWH. How big a roof will fill it up? How often? =((70000+12000+6000+4000)*1.3) = 119,600KSh = $1,441 ? What is the vacation period? What happens to rainwater collected when school is not in session? Thanks for your questions. The speed at which the tanks will fill will depend on the local rainfall as well as the roof top surface area. We will be making individual calculations using a similar formula that Lynn is using in her project and following CAWST's rainwater catchment guidelines. I will upload the document that we will be using to our 'additional documents' section of the proposal. The calculation refers to 70,000KES for the 10,000 liter tank; 12,000KES for the 2,000 liter tank; 6,000KES for the 1,000 liter tank; and 4,000KES for the 500 liter tank. The multiplication of 1.3 will cover the additional costs incurred in transporting and installing the system i.e. transport; labor; gutters; and other materials. The exchange rate is calculated at 83KES/1USD. There are 3 semesters in the school year in Kenya. The longest vacation is about 2 months long and fall December-January. During the vacation periods, the care and maintenance plan will be similar to that of the school biosand filters. The school watchman will have the responsibility of draining any debris from the catchment pipe as well as letting students and nearby community members to collect water from the systems as necessary. The school watchman will also be using water from the RWH systems to feed water into the ACI biosand filters each day. Thank you for your questions - I am pleased to provide clarification. Thanks Lynn for your input too. I will respond to each comment separately. The rainfall data is currently being collected at the 13 schools in the rural areas around Eldoret. We set up the initial set of rain gauges at these locations because there is a wider variation in rainfall there than in our schools in the Kisii region. In the Kisii region, the longest spell without rainfall is usually no more than a month, and the rainfall is heavy (1,600 - 2,000mm of rainfall annually) and relatively reliable. As I stated in the proposal, the Kisii region is an ideal place for roof rainwater catchment systems. ACI is not currently operating in any arid areas as they would not be a good fit for our biosand filter project - the filters rely on regular input of water to function effectively. The surface area of the roofs at the schools at which we are working is substantial and all of the schools have metal roofs. We will make our final selection of schools for this project based among other things upon computations of roof top surface area, seasonal rainfall and student population. Regardless of whether the rainwater systems are placed in areas of high rainfall or more irregular rainfall, there will be a significant impact. The schools will have the capacity to collect and store water more easily as well as provide a high quality demonstration rainwater system that will support the Community Development Entrepreneur's business. The rain water tanks can be used for storing water and this will be especially helpful during the dry seasons. This water will help to provide a more consistent and convenient source of water for pouring through the ACI biosand filters at the school. If the rainwater runs out, the schools will have to temporarily revert to their previous source of water, or perhaps purchase another rainwater catchment system from the CDE based at their school. The training of Community based entrepreneurs and local experts, supports community involvement and participation. It also instill in the minds of the locals, community ownership. Great program! I am a huge believer in implementation trainings in schools to start institutionalizing alternative/appropriate technologies and WASH education in the young generation! This project has a solid strategy in targeting school children with a competitive cost-benefit ratio. To this end, the two factors make this project scalable in the future for continued success. The project is good is supporting community in area where they really need the the support and showing the element of sustainability. The project has a novel approach to solving water problems in areas where rain harvesting is the only viable alternative. The choice of schools to set up a village example solves two problems. The first is that many projects do not take into account the vulnerability of school children´s health in executing project and the second is the new generation of children will experience this technology and very likely carry it into their homes in the future. Using the small entrepreneur approach to installing hoyusehold systems will give the project a sound sustainabilityn factor since the villagers will have to make a hard and serious decision about how they expend their scarce resources. It would be very helpfull to set up a method so that all the PWX participants could get feedback on how this model works over ea period of years since it could serve as an example , if successfull, for all to use. While the approach is good and promising, i want to see how school projects (currently in favor across the world) translate into community action. Schools and business model projects are a good attempt into introducing concepts and providing some benefits, but we need to incorporate them into a broader approach to ensure equity and 100% coverage. This is an excellent project - very well thought out and organized. Adding rainwater harvesting to the suite of products and capabilities of Aqua Clara makes a great deal of sense. All of the questions were answered completely. The budget looks fine. The project builds on the successes in the Kisii region. The development of CDE's does what needs to be done. The use of microconsignment is a great way to ensure sustained funds for the next project(s). Water quality testing as part of the ongoing maintenance is essential. The follow up in the hygiene clubs will ensure continued emphasis on clean water, sanitation, and hygiene. students have a chance to get involved in the upkeep as well. Rainwater collection system is not perfect. Cannot drink the water and when the tank dries out because of drought, the school must revert to previous water collecting systems. Program appears successful with a proven track record. I think the inclusion of Community Development Entrepreneurs to provide a for-profit component to the proposed RWH, BSF and VIP installations will enhance to success and sustainability of the program. The follow-on aspect is often the weakest part of NGO programs in the developing world, often leading to stranded resources that do not benefit the intended beneficiary. I am amazed at the complex infrastructure ACI has incorporated into their program and wish to learn more about their model.